John Petrucci talks at length about and demonstrates the features of his signature Dreamscape modulation pedal from TC Electronic in this video. On his twitter account, he posted this photo which includes many other pedals. At 12:32 of this rig rundown the TC Electronic The Dreamscape John Petrucci Signature Modulation Pedal is show on the pedal board of Ryan Roxie of [Slash's Snakepit](http://equipboard.com/band/slash-s-snakepit). The product website insists that Vernon Reid uses the Dreamscape pedal. 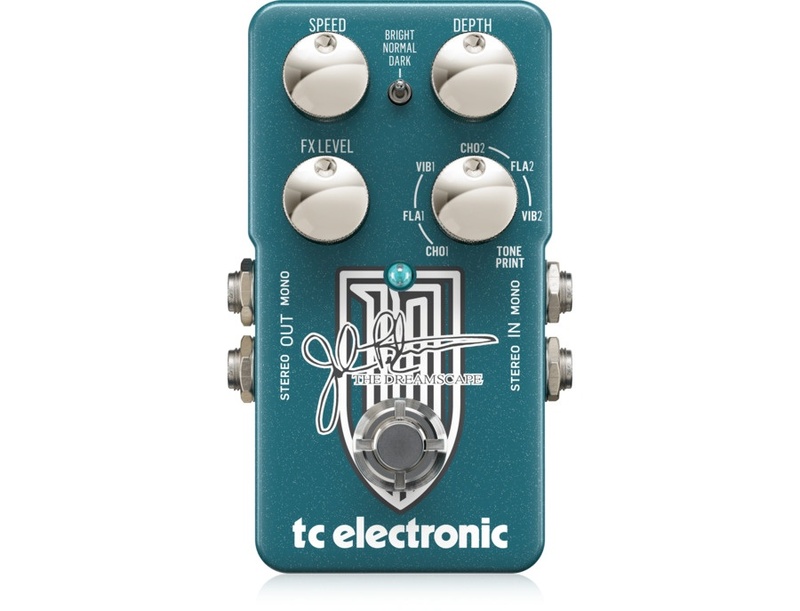 The Dreamscape John Petrucci Signature Modulation pedal is one of the TC Electronic products used by Phil Campbell, according to their website, on [this page](http://www.tcelectronic.com/phil-campbell/). Used with Phillip's theremin. Mentioned in source video at 0:41. In the song “Warhol’s song” this pedal were used along with some other effects. This pedal is also used in the song “Bad Boys”. Great Minds Rock Alike John was one of the first rock stars to join our TonePrint program and his sounds proved so popular we decided to cooperate intensely and capture his interpretations of classic TC effects. We joined forces and the result is what happens when you set John free on the effects that inspire him. Straight From The Gospel Of John Since they are such an integrated part of his "voice", John knows our products like the back of his hand - so he knew exactly what he wanted, yielding some of the best sounding modulation effects out there. Modulation Mastery. Multiplied to Infinity Dreamscape houses Chorus, Flanger and Vibrato effects that will keep you challenged, inspired and coming round for riff-inspiring possibilities. Access to Greatness Whether John is your main inspiration or you kinda dig his sounds, we've added a voicing switch that features a 'dark' setting - a mode that perfectly represents John's signature dark voicing that sounds great whether you wanna sound like the man himself or carve your own path. Again, I am a fan of JP so I was influence but this pedal is a great pedal. Very easy to use, 2 type of chorus/flanges and tremolo. You can also download Toneprints from the TC Electronics website to copy the exact sound from your favorite artist. Tc Electronics is a very good brand, quality and durability are the main features . No exception for this model,good looking and with a super bright LED. Runs in stereo or mono and contains three modulations : chorus, is good clear and true to the original signal; flanger, I'm not a big fun of flanger but i recognize that this one is good and smooth; vibe, probably the best effect on the box,it sounds very naturall and crisp..love it. If this is not enough there are the v2 of all the three effects that Petrucci uses when he play distorted (you can use them also in clean,he is not gonna come to your house and break your guitar ) . Also there is the toneprint switch so that you can create your own cool modulation and load it in the pedal! The controls are easy, speed ,depth and fx level. It's over? Nope, there is a toggle switch that changes the soul of the modulation: bright,normal,dark. I leave to you the imagination on how they change the sound. Anyway i love it because i can have three quality effects in one small pedal but I would use single stompboxes for each effect in studio.